All around the world, millions of people spend their days behind desks, staring at screens, with their hands uncomfortably poised over their computer. An ergonomic keyboard can’t get you out of the office, but it can at least give your hands some relief! 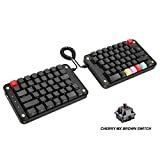 These computer accessories are designed to ease the strain a traditional keyboard inflicts on your hand, wrist, and arm, as an ergonomic keyboard (unlike a traditional keyboard) is designed to fit the natural position of your hands. It can decrease discomfort in the hand and arm as well as reduce the pain from maladies like carpal tunnel, arthritis, or tendonitis. There are a ton of ergonomic keyboards out there – read on to find out how to choose the best ergonomic keyboard for you. Ergonomic keyboards come in many styles, though all are meant to reduce discomfort in the hand and wrist. We’ve broken them down into three major categories to help you compare and find the keyboard that’s right for you. Split Keyboard: As its name suggests, the split keyboard is either partially or completely split into two pieces, unlike the typical computer keyboard. 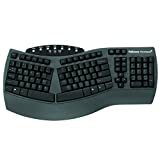 This style of ergonomic keyboard often sets the right and left hand keys at an angle to each other, so that your hands, wrists, and arms are able to fall in a natural position instead of an uncomfortably straight position. “Wave” or Curved Keyboard: The “wave” or curved keyboard is similar to the split keyboard in that it allows your hands to rest in a natural position, but there are a few key differences. For one, the curved keyboard doesn’t always split up the keys into sections, instead it spaces out individual keys for better reach. This type of keyboard also arranges the keys in a curving, easy-to-reach pattern. Curved keyboards often have cushiony, curved wrist supports too. Contoured Keyboard: Contoured keyboards are really unique! These have a lot of empty space separating the right and left hand keys, and the keys themselves are in little depressions or cups. The contoured keyboard supports and raises your hands and wrists, leaving your fingers to comfortably hang in place over the key depressions. Easy to switch: Many customers looking for ergonomic keyboards are tech consultants who must use lots of other people’s computers while at work. They say it’s important to find an ergonomic keyboard that keeps the keys in the standard QWERTY order so that you can still type easily when you have to use another person’s keyboard. Ergonomic keyboard reviewers also mention that getting used to their ergonomic keyboard and new hand position takes about two weeks on average but is well worth it. 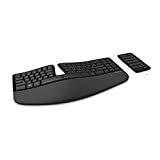 Wireless Connectivity: Reviewers raved about wireless ergonomic keyboards, which not only support the hands and wrists but also allow you to set up your keyboard wherever is most comfortable instead of just wherever the cord reaches. 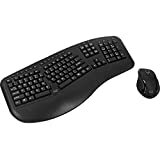 Be sure to check reviews to ensure the wireless ergonomic keyboard of your dreams has high marks for maintaining a steady connection. Durability: The top ergonomic keyboards were praised by reviewers for lasting multiple years. After all, computer accessories can be expensive, so you should make sure the one you purchase is durable and reliable. 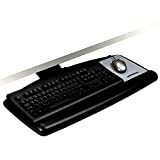 Compatibility: Reviewers praised ergonomic keyboards that were compatible with all kinds of computers – Mac, Windows, etc. – because that meant they could use the same keyboard even if they got a new work computer or switched laptops at home. 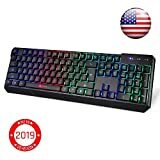 Shoppers who work in software development and IT also suggested looking for an ergonomic keyboard that was compatible with their job, allowing easy access to the function, CTRL, and other special keys necessary in their daily work. In addition to considering what type of ergonomic keyboard you need, it’s important to consider other factors as well. As an example, some keyboards offer additional wrist support, and some focus on hand position. Some ergonomic keyboards are best for typing regular words, whereas others are better for keying numbers or special functions. When purchasing an ergonomic keyboard, consider what you do and what your needs are! Make sure to think about whether or not you want a wireless keyboard. 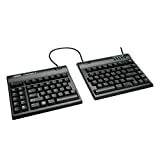 Ergonomic keyboards come in corded and wireless styles, so think about where your keyboard will be positioned and how long of a cord (if any) you will want. An ergonomic keyboard that’s the wrong size for your hands won’t offer all the relief a properly sized ergonomic keyboard would. Look for a keyboard that is sized appropriately – too big and your fingers will reach uncomfortably, too small and you will lack sufficient hand and wrist support. It might be helpful to go to your local computer store and try some out in person. This will ensure you purchase the correct size. Additionally, your keyboard is a personal preference – everyone’s body is different, so what feels good to your co-worker might not work for you. Some ergonomic keyboards have a “number pad” that looks like a little calculator and is completely separate from the letter portion of the keyboard. This allows for more flexibility in setting up your workspace and could be great for people who type numbers often. On that note, think about what type of movement you do the most, and buy a keyboard that’s tailored for it. For example, as we discussed above, a separate number pad is great for accountants and those in similar professions. A keyboard with easy access to function keys is awesome for software developers and IT professionals. If you have pain somewhere specific, get an ergonomic keyboard that’s tailored to your problem. A keyboard with wrist support may be really important if you have wrist trouble. As another example, if you have forearm pain from twisting your arm to use a regular mouse, think about a split keyboard that would alleviate that twist. Microsoft: A giant in the computer and tech world, Microsoft designs some of the best laptops, software, and of course, ergonomic keyboards. They’re a trusted name with a wide range of products to fit your needs. Logitech: Founded in Switzerland in the 1980s, Logitech is now practically a household name. Their high-quality products and computer accessories are distributed in over one hundred countries worldwide. 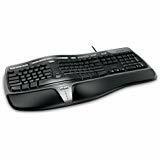 Fellowes: Fellowes is an office supply company offering everything from paper shredders to ergonomic keyboards. They are committed to streamlining your office environment to make your work day easier. Perixx: Perixx is a German computer accessory company founded in 2006. They specialize in input devices such as keyboards and mouses and deliver solid products at competitive prices.